When available, daily average values for carbon dioxide in the atmosphere are posted here as a year-over-year comparison. Measurements are made by two independent CO2 monitoring programs (NOAA and Scripps) at the Mauna Loa Observatory in Hawaii, about 3400 metres above sea level. CO2.Earth presents a year-over-year comparison of recent daily readings for public education purposes. Tracking these readings can provide opportunities for in-the-moment learning about the seasonal cycle and trend for atmospheric CO2. See the "notes" tab on this page for important information about the daily CO2 data reposted here. Explore the tabs below to view visuals and links associated with the latest CO2 readings from Mauna Loa. This Scripps graphic shows hourly CO2 averages with small grey dots, and daily averages with larger black dots. Scripps reports daily averages based on Mauna Loa local time. 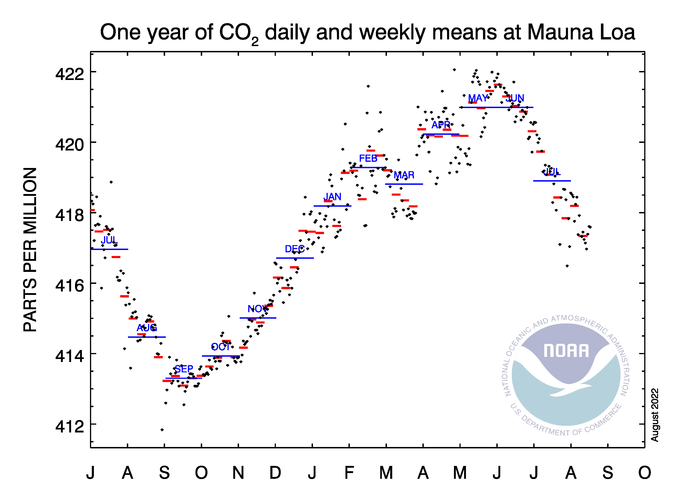 This NOAA graphic shows daily CO2 averages with black dots, weekly CO2 averages with red lines (Sunday to Saturday) and monthly CO2 averages with blue lines. NOAA reports daily averages based on local time in Boulder, Colorado. Scientists compute daily averages from selected hourly values that meet defined standards. Daily averages are used to calculate weekly and monthly averages. The daily CO2 report at CO2.Earth uses data collected at the same location, the Mauna Loa Observatory, by two indepedent CO2 monitoriing programs. NOAA-ESRL has monitored CO2 at MLO since 1974 and now runs the facility. The Scripps Institution of Oceanography started monitoring at MLO in 1958 and continues to monitor CO2 from this site. Scripps reports daily averages based on local time in Hawaii, USA, where the monitoring station is located. NOAA reports daily averages based on local time in Boulder, Colorodo, USA where its headquarters is located for a global network of stations that monitor atmospheric levels for CO2 and other greenhouse gases. Daily averages of CO2 readings are preliminary and subject to data quality checks and adjustments by scientists. CO2.Earth presents year-over-year comparisons using the latest available data. This may include data collected by two different CO2 monitoring stations. This comparison may be considered of value for public education purposes. However, it does not reflect scientific practices and any conclusions about long-term trends for atmospheric CO2 should be based on longer-term, more precise data comparisons that are available. Tables at CO2.Earth are updated manually. If you notice an inconsistency with the source data, give us a nudge.